The Shivapuri and Nagarkot Village Trek is one of the finest trekking routes within The Kathmandu valley.Though it is only 25kms from Kathmandu, it provides a very good insight into the village life and culture to be found within the valley and Shivapuri village (2729m) is a wonderful example of the true spirit of Nepalese hospitality. The trek is named after the Shivapuri National Park, the nearest National Park from the International Airport just 25 kms away. The trek is likely to especially appeal to nature and bird lovers as there is so much flora and fauna on hand, very few tourists are on the trail and therefor nature is often “close up”. Shivapuri hill (2729m) is the highest point of the trek, from the top of Shivapuri there are some fantastic mountain views including Mt. Manaslu,The Ganesh Himal Range and The Langtang Range.Our final trekking destination is Nagarkot, a popular resort type hill town where once again the views of the Himalayas are there in full splendour, especially at sunrise and sunset.Shivapuri National Park as it is now known was established as The Shivapuri Watershed Reserve in 1976,renamed The Shivapuri Watershed and Wildlife Reserve (SWWR) in 1984, before being granted National Park status a few years later. Since Shivapuri lies in the transition zone between a subtropical and a temperate climate, the vegetation consists of a variety of natural forest types, depending on altitude variation.The area is also known for the medicinal herbs that are found at higher altitudes. A hundred and twenty nine species of mushrooms have been identified and catalogued by the Shivapuri National Park. Among the wild animals, Sloth Bear (Melursus ursinus), Leopard (Panthera pardus), Muntjac (Muntiacus muntjak), Pallas’s Cat (Felis manul), Large Indian Civet (Viverra zibetha), Himalayan Yellow Throated Marten (Martes flavigula), Indian Pangolin (Manis crassicaudata), Wild Boar (Sus scrofa), Goral (Nemorhaedus goral), Indian Porcupine (Hystris indica), and Common Langur (Presbytis entellus) have been spotted in or around the park. Numerous birds, butterflies and lizards are also prevelant and 177 species of birds of which 9 are listed as endangered have also been recorded. Day 01: Arrival in Kathmandu (1320m.) Arrival in Kathmandu /received at the airport before a short journey to your hotel. Time to relax up in the evening there will be a tour / itinerary briefing and an introductory evening meal at a traditional Nepali restaurant. After an earlyish breakfast, transport awaits to take you to the start point of the trek. The walk takes us through a lush forest and onto a ridge.We walk along the ridge / some spectacular views of Annapurna, Manaslu, Ganesh Himal, Langtang and Jugal Himal. Overnight at Kakani. Up early for morning sunrise over the Himalays before taking a healthy breakfast / tents are packed / commence our journey to Shivapuri (2729m.) From the top of Shivapuri hill there are some great panoramic views of the western mountains. Overnight at Shivapuri. Early morning for sunrise over the snow capped mountains / After breakfast start trek to Chisopani (2194m four hours) / Chisapani is another great view point for sunrise and sunset over the mountains. Chisopani to Nagarkot (2175m.). Nagarkot offers breathtaking views of the Himalayan mountains along with quality accommodation and high standards of service, if you are in love it can also be incredibly romantic!. 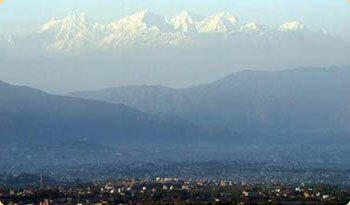 It is difficult to believe that there is a dusty and bustling Kathmandu City just 25kms away or an hours drive. After sunrise over the Himalayas and breakfast at the resort, we drive to Dhulikhel / an hour’s drive east of Kathmandu / Dulikhel is an old and very well kept Newari trade station on the road to the Tibetan plateau / today it is an ideal place for visitors to enjoy the natural environment and the typical lifestyle of old Newari culture / yet again there are some spectacular mountain views from here. Early morning start by car/bus to Kathmandu /transfer hotel / arrive mid morning / rest of the day free or a day to explore this lively and exotic city. visit the World Heritage Sites of the valley. In the evening, a farewell dinner is served at Nepali typical restaurant.